Beautiful laser wallet checks come in seven different colors and contain a void pantograph. Designed to be used with popular software programs like Quicken. Easy record keeping is on the left side with a perforated stub. 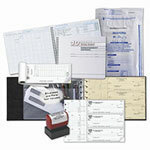 All checks meet and exceed specifications required by the Bankers Association. Can be used with a laser or inkjet printer.